Back at the dawn of rock ’n’ roll, when Sun Records’ legend was aborning, Elvis was proclaiming that’s all right while Johnny walked the line; meanwhile Carl warned us to lay off of his blue suede shoes, and Roy was vexed by a mean little mama. 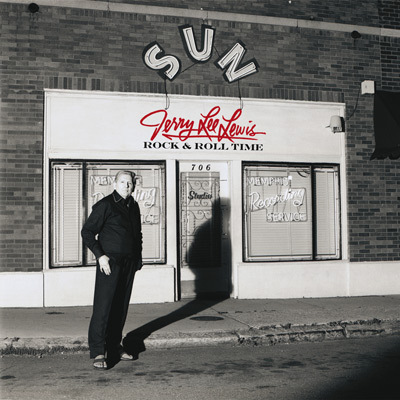 But really, it was fiery hell-raiser Jerry Lee — and his pumping piano — who left us breathless. Did he sell his soul for rock ’n’ roll? Maybe. He’s certainly had one hell of a life, though. Fast-forward to 2014; after 55 years and more than 60 records, rock ’n’ roll’s original wild child has gifted us with a new 11-track release. A fine follow-up to 2006’s aptly titled Last Man Standing and 2010’s Mean Old Man, Rock & Roll Time is all Killer, no filler. This latest gem also boasts a host of all-star contributions from loyal Lewis acolytes Robbie Robertson, Neil Young, Keith Richards, Ron Wood, Nils Lofgren, and Kris Kristofferson, among others. It seems appropriate, considering he is one of the last living links to the source. The whole album rocks, especially the Kristofferson-penned title track, which Lewis ends with a wry chuckle, and the cover of the great Chuck Berry’s “Little Queenie,” which Jerry Lee kills while Richards lays down the groove. Lewis’s takes on Dylan’s “Stepchild” and Lynyrd Skynyrd’s “Mississippi Kid” are equally amazing. But ultimately his rendition of Johnny Cash’s “Folsom Prison Blues” is the choice cut, as well as a fitting homage to his Sun Records homeboy. Pete Townshend once sang, “Long live rock — be it dead or alive!” As long as Jerry Lee Lewis is alive, rock ’n’ roll will survive.